Pretty good Western that gets better as it goes along. Railroad agent Steve Davis (McNally) goes undercover to catch an elaborate gang of train robbers. Along the way, he meets lovely songstress Mary Williams (Smith), but much worse, has to go to prison to establish his outlaw cover. The gang, it turns out, has respectable confederates but we can't be sure who they are. 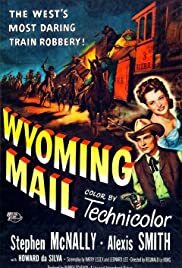 There're several good surprises, plus some nice touches from director LeBorg— e. g. a wounded Indian Joe trying to hook on the train, the final scene that hits the right notes, a frantic outlaw (Jaeckle) atop an exploding baggage car. Also, that rock formation of the gang's hideout is impressive as heck, with its spindly ladders to the caves at the top. Then there's a splash or two of great blue sky scenery. The supporting cast is also notable—Begley, DaSilva, Evans and Jaeckle, plus a young, curly-haired James Arness and-- look quickly—Richard Egan as a prison guard. Universal Studio did a number of these Technicolor Westerns at the time, using solid performers and location filming. None that I've seen reach the first rank, but do remain solid entertainment for horse opera fans, including this one.